hi guys, just something about me. i'm from italy (genoa) and i own a r50US built in 1969 and it's been imported here last year from texas. Does the background in the photo below look familiar? The 1963 R50/2 belongs to Vincenzo Gambardella, of Italy. actually i know a Gambardella here in Genoa, but he doesn't ride motorbikes....by the way, you know that you're are known in Italy ? In the world of vintage Bmw many people, including myself, in the posts often mentioning your sites as a referring point to the discussions ....it's a pleasure write to you! Welcome and explore the left-side of the screen as there is a HUGE amount of knowledge on this website. how I find the exactly numbers of r50US producted ? In the website of bmbikes report the quantity of 401 (?) ..... is that correct ? can you help me ? There is really no way of knowing how many R50US models were built. Phil Hawksley's website lists 401? meaning he doesn't really know. US models and engine numbers are included in the range of engine numbers for the R50/2. BMW did not keep separate figures for the number of models produced before 1970. No, I did not know that. And I do not speak Italian! However, when I was in college I did visit Rome and Florence as a tourist. actually I did...and I would like congratulate you on what have you done on this site...congratulations to everybody, there are informations galore! thanks Kurt, I thought so....I suppose it's the only reliable site we can rely. Don't worry about italian....I hope my english it's understandable. In Rome I did the military and I saw Florence about 30 years ago. - I noticed that on all bmw headlight is mounted a second red light dinamo......why if there is already it's original one? - the telescopic forks mounted on all bmw US version were assembled in Germany or in the USA? The second red light, which is only on the late (68-69) bikes and those that have needed a replacement headlight bucket, is actually the generator light. The original, triangular red light was converted to a high beam indicator on those later bikes. These bikes were all assembled in Munich; they are called US bikes because the "experimental" forks were only available in the US market. BMW did not sell them anywhere else, and there were apparently howls of protest at the time in their domestic market. Meanwhile, Butler & Smith, the US importer, ran ads saying that you could have your bike either way, Earles fork or telescopic. I remember having a conversation several years ago with two older and very experienced BMW motorcycle guys who maintained that 'US' in BMW models did not stand for United States, but rather for 'Universal Strut', but I don't remember anything about which countries they were available in. 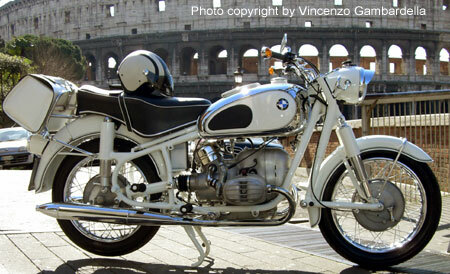 Any comments from the BMW historians among us? I'll appreciate if I could get any sort of information about my bike because I never received any answer when I wrote to andreas.harz@partner.bmw.de and today I wrote to info.grouparchiv@bmwgroup.com hoping to get answers. I have owned several BMW's over my 30 years of riding. I recently bought a 1969 BMW R50us in barn fresh condition, that was last registered in 1988. I replaced the tires,battery, cleaned the carbs, replaced the cables and the fluids and after kicking it for what seemed like an hour, it started! She shot out a lot of smoke and rust for the first 90 seconds but them calmed down and settled down to a nice idle. I took her out for a short ride and I was really impressed at how she sounded, rode and handled. The bike is bone stock and is a "us" model, but it has a KM speedometer which works perfectly and shows only 26000 km. My question is; did they sell "us" models in other country's? My second question is; What is the best type and weight oil to use in the motor? I don't see an oil filter. Is there one that I am missing? does it have a serviceable debris screen that should be cleaned? Do I need to use a low or no detergent motor oil. Other than a screen in the sump and maybe a magnetic drain plug, the engine has oil slingers instead of an oil filter to get the bad stuff out. The slingers are bolted to the flywheel and can only be inspected and serviced by taking the engine down to that level. I think the service guide is to clean them at least every 30,000-50,000 miles or so. If your bike only has 26,000 km (or a little over 16,000 miles), you aren't close to that figure. But a lot of folks would check them just to know where they are at - if they get stuffed, you lose oil circulation to the crank. Not good. With regard to oil, the consensus seems to be Valvoline VR-1 single weight. I use 40w in the summer and 30w in the winter. Why worry? Get them cleaned when you can. 59 R60, 1976 CT90, 1983 R80RT(sold), 1998 R1100R 75th Anniversary Edition, 2002 F650GS new to me. Lakes Region, NH & Sonoran Desert AZ "Have Leatherman Will Travel"
I need a little advise with 69 R50us steering head bearings. I want to convert it from the ball bearing to a tapered bearing set up. Are the bearings different on a us model with telescopic forks from a /2? Does anyone have a BCA or Federal part number so so that I can buy them from my local NAPA store? I looked around and I see that most suppliers want 100+ dollars for a set of bearings! Is there any supplier who sells them for better price? Any help would be appreciated.